Child labour is becoming a widely discussed and a major issue in almost entire world but in countries like Pakistan, it has grown to a dangerous level. Roughly, 11 million children are working labour jobs in various tea stalls, workshops, hotels, restaurants, offices, brick kilns, footpaths, and almost in every nook and corner of Pakistan. 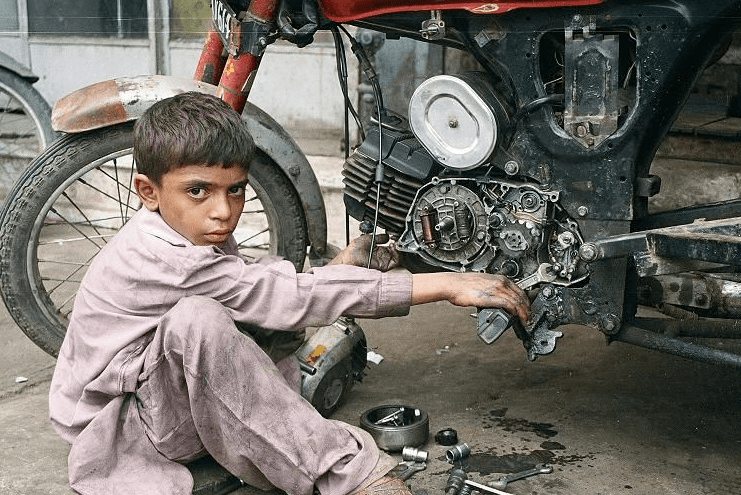 Children between the age group of 5 to 16 are compelled to do these kinds of jobs to earn some amount for their families as they belong to a poor and underprivileged class of society. These children are deprived from their basic right to go to school and are pushed towards the work which causes mental, physical, social and moral harm to them ultimately leading towards a depressed and ignorant childhood. These poor and innocent children work hard from day to night and are treated like beggars by their “Ustad” who provides low wages of Rs 100 or 200 weekly and sometimes provides only lunch to them. According to a survey, the average income of child labourers in Pakistan is Rs 1000 to Rs 1500 monthly which clearly indicates that how badly these little, poverty-stricken, souls are being exploited. Child labourers usually work in perilous conditions where there are no hygienic measures which eventually lead to serious health problems among these children. These underage children continue to work for long hours without getting proper diet, sleep and rest. Because of this harsh routine, many children become malnourished and depressed thus becoming wild and frustrated adults of tomorrow. Since these children don’t get the necessary and basic education so when they turn into adults they are unable to find jobs which eventually leads to hike in unemployment and slows down the economic stability process of the nation. This situation increases illiteracy, crime rates and poor human development. As these children spend most of their time outside their homes so they are not provided with ethical and moral support which is needed at this tender age. Because of being away from their parents and having little or no parent monitoring, these children get addicted to illegal activities, drugs and other crimes thus running their whole life. As these children are highly underpaid, this lowers the country’s per capita income thus hindering economic growth of the nation. Many families and children start begging on roads and streets when they are unable to get jobs or in the other case when they are not provided with satisfied income. Situations like this create a strong urge in little children to earn a handsome bunk of money at once which turn them into thieves and they start getting involved in serious and dangerous crimes. 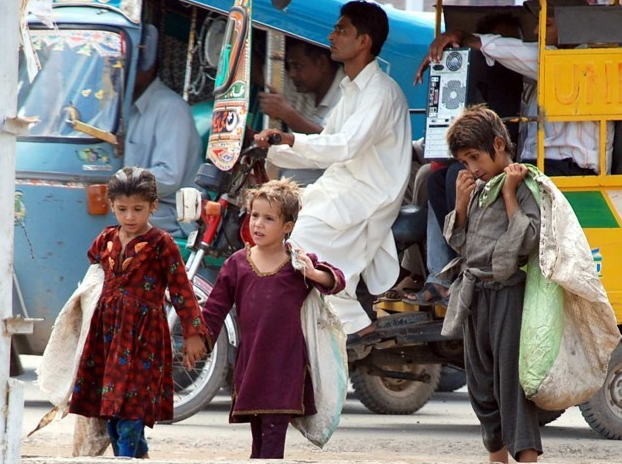 Poverty is the greatest single cause of child labour in Pakistan and in other countries too. Approximately, more than 25% people in Pakistan are below poverty line and their only purpose in life is to fulfill the basic necessities of life i.e. food, shelter and clothes. Poor families usually have more children and the income of a single person could not suffice even these basic necessities of the family in any possible way. So, the only way these families know to have the basic necessities fulfilled is to let their children go out and find work to get some extra income. To support their families, these children start work at different teashops, stalls or factories and unfortunately compromise their childhood under these bitter circumstances. Every parent tries to fulfill the basic necessities of their children and dreams of giving them a good life. Similarly, every child has a right to have a beautiful childhood where he is free of any laborious work and have a basic right to get educated. But due to poor living conditions, these parents are left with only one option which is to send their children out to have some work so that, in this way, they may be able to have something to eat. Because of this harsh reality, these purest and beautiful souls start working too hard at an early age and at minimum wages which in turn causes a great amount of social, materialistic and psychological pressure on them thus destroying their healthy physical and mental growth. People try out different ways to get them out of poor living conditions and child labor in one of them. But, this is the time when parents and every other person need to realize that the child labor is not a solution to poverty. This kind of attitude of parents and society which forces children to work outside where they are treated just like servants and bear the inhuman behavior of those so-called people who are higher in status destroys the personality and self-esteem of these innocent souls and turn them into damaged individuals. They think it’s just okay to be treated like this because they are poor and have no right to stand for their rights. Children are future of our country and it is up to us to make or mar our future. Child labor is and will never be the solution to eradicate poverty from Pakistan. This will only make the situation worse to that extent where eventually it will become impossible to handle. So, if we want a bright nation, we should make the future of our children bright by getting them able to have at least basic education and a sense of self-actualization. If they will have basic education, they will be able to become self-sufficient and support their families in a respectable way where they will not need to beg in front of others for food and shelter. I am Hafiza Ayesha Khalid, a Computer Science graduate from PUCIT, Pakistan, a freelance and a technical writer who loves penning down life experiences, biographies, technical blogs, property blogs, new fashion trends and business related articles. I am passionate about technical writing because it combines my two interests – writing and technology – in almost seamless ways. I feel a little bit more of myself, when writing, because it makes me connect with the universe and helps in realizing that I am still alive. Choose your words wisely because your words shape your reality.